The Andrew Grant books in order include his popular Cooper Devereaux series and his David Trevellyan series. Cooper Devereaux is an Alabama detective with a lush lifestyle, while David Trevellyan is Royal Navy secret agent. Both series include so far three books each. Here are the Andrew Grant books in order for all his novels in the series and standalone writings. Andrew Grant is a British crime mystery author who has two other famous writers in his family: he is married to another novelist, Tasha Alexander, and his own brother is the famous Lee Child, author of the popular Jack Reacher thriller novels. Born in 1968 in Birmingham, England, Andrew Grant attended the St. Alban’s school in Hertfordshire, and later he attended and graduated from the University of Sheffield in English Literature and Drama. His first job was working for himself by setting up a small local theater company producing theater plays. Due to financial problems he got involved in the telecommunication industry, where he remained for 15 years before a current redundancy program. Being free from the corporate ties, in 2006 Andrew decided that it’s time to start writing novels. After all, writing books is a major part of his family tradition as well. He started writing his debut novel, Even in 2006, he then finished it next year in 2007. A few months later he found an agent who loved his book, and then early 2008 he got his first contract. Even was published in 2009 and became an instant success. It also became the first book in the David Trevellyan series, which currently includes 3 books. Author Andrew Grant currently lives in Sheffield with his wife, Tasha Alexander, who is also a well-known author. Andrew often travels to Chicago, which is where his wife is from. He is currently working on his second series, Cooper Devereaux, which has already seen a third book published with the title False Witness early 2018. He also has a standalone novel published in 2014 with the title Run. Cooper Devereaux is an Alabama cop, a rebel who loves to bend the rules every now and then so he can get the job done when the legal ways cannot. Due to his unorthodox ways, he has been suspended more than once from his job. In the first book, False Positive, he is in fact once again suspended, but he gets the word that he is reinstated because he needs to work a case of a missing 7-years-old child who has been abducted. And the clock is ticking. In the second Cooper Devereaux book, we meet Cooper again, this time investigating an arsonist who is burning down empty schools. During one such case, the police found some burned bones, which means this time it’s murder. But the question is, are the murderer and the arsonist one and the same? In False Witness, police detective Cooper Devereaux is once again on the job, this time investigating a case involving several victims who were murdered on their 21st birthday, which gave the serial killer the name Birthday Killer. The Andrew Grant David Trevellyan series deals with a British undercover operative working for the Royal Navy who is a cross between Jack Reacher, James Bond, Jason Bourne and even Michael Weston. Even is Andrew Grant’s debut novel, which was published in 2009. Lt. Cmdr. David Trevelyan never follows protocol, has a total lack of empathy and has an analytical mind that helps him be the assassin he is without ever losing his cool. The books are all action-packed and the bodies David leaves behind in his adventures are plenty. While in the first two books David works in the US, in the third and so far book, More Harm Than Good, David has to work at home, in London, which is a bit out of the main character’s comfort zone. If I am not mistaken, More Harm Than Good is the first and so far only self-published book by Andrew Grant, on Createspace. Several reviewers noticed that the spelling and grammatical errors are more abundant in this novel, which coincides with the lack of a professional proofreader and editor for this book. While the David Trevelyan series comes a bit closers to Jack Reacher, I do prefer the author Andrew Grant’s Cooper Devereaux series. It has less piled-up bodies, but I do like the main character somewhat more. Run is Andrew Grant’s first standalone novel published in 2014. The book focuses on Marc Bowman, a genius IT consultant who was fired from his job, left by his wife and robbed pretty much at the same time, which makes you wonder, what is really going on here? Are there some more sinister plots at play or is Mark simply just so very unlucky all of a sudden? The book is fast-paced, action-packed and intense, a trait with most of Andrew Grant’s books possess as well. 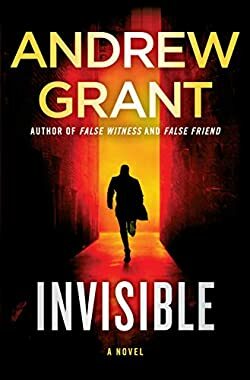 The second standalone Andrew Grant book is Invisible, published in 2019. It is a thriller featuring Paul McGrath, an Army veteran, who, after his father’s murder, goes undercover and takes a job as a janitor at the same courthouse where his father’s case was held. In this job is pretty much invisible, and even better, he as security clearance and access to the entire building. This means that he can now not only try to solve his father’s murder but also that of others who have fallen victims.